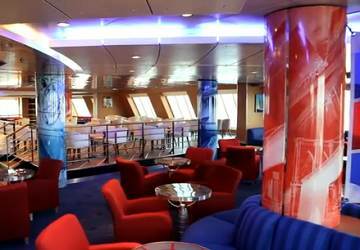 The Superfast VII along with her sister ship Superfast VIII is among the largest and most luxurious ships in the Stena Line fleet and features a level of quality, comfort and service never before seen on the Irish Sea. 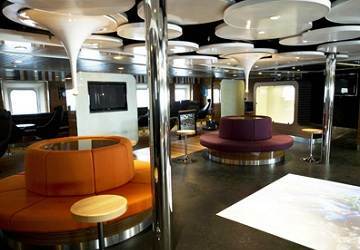 The Superfast VII provides the best ferry experience on the Irish Sea with numerous facilities including a Nordic Spa, the ‘POD Lounge’, a chill out Living Room, ‘Taste’ dining, free Wi-Fi, free movies, Curious George for the kids and the exclusive Stena Plus Lounge. 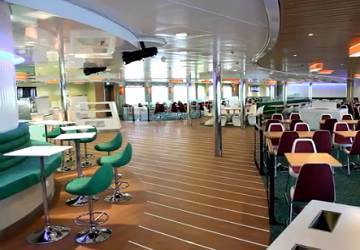 Due to the short crossing, cabin accommodation is not available on the Superfast VII however reserved seating is available in the Stena Plus Lounge. 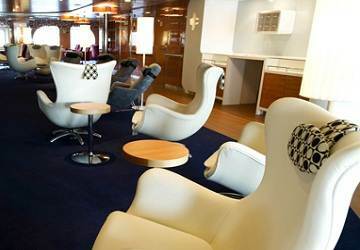 Stena Plus offers a range of comfortable leather seating including sofas and sofa chairs on two levels, so you can find the area which is just right for you. 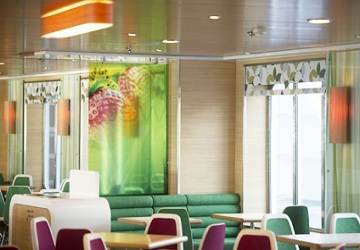 In addition to seating, passengers who travel in the luxurious Stena Plus lounge can enjoy waiter service and choose from a premium menu which includes a range of speciality seafood dishes and old favourites. 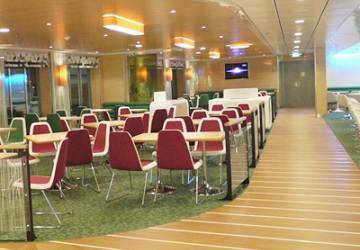 So you can simply relax in your seats and order meals at your leisure. The all new quick food experience ‘TASTE’ serves a great selection of fresh and tasty meals for breakfast, lunch and dinner. There’s something to suit all tastes and complimentary refills on tea and coffee while in the Barista Coffee House and Bar you can savour a range of Italian Coffee or a tempting snack. In the Superfast VII shop you’ll find a range of gifts, jewellery and fragrances with prices on average 40% cheaper than the UK high street. 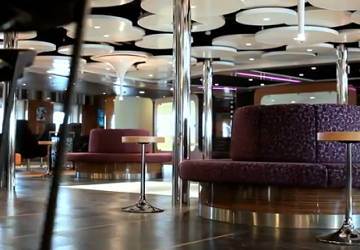 Chill out in the onboard ‘Living Room’ – your lounge at sea! Enjoy complimentary magazines and all the latest news on 70” plasma TV screens. 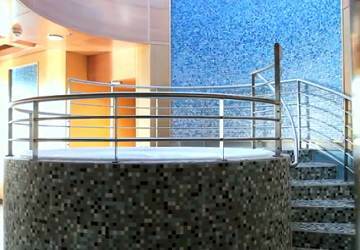 Visit the ‘Pure Nordic Spa’ for a dip in the Jacuzzi or sauna to ensure you arrive rejuvenated and revived (only available to Stena Plus customers). 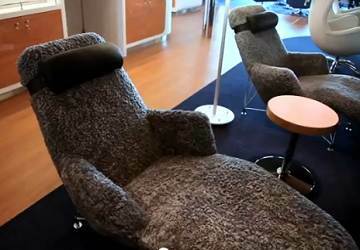 In the new concept POD lounge you’ll find an interactive zone with all the latest in technology including iPads, Xboxes and surf stations and a futuristic living digital display on the floor. 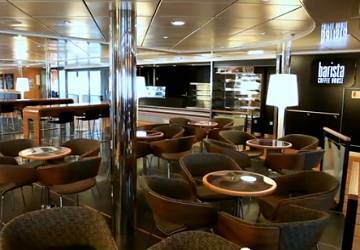 You’ll also enjoy free Wi-Fi in the lounge and throughout the vessel. 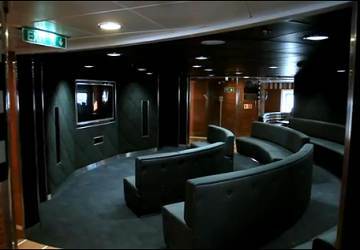 If that isn’t enough to keep you occupied during your trip then sit back, relax and enjoy one of the free movies! 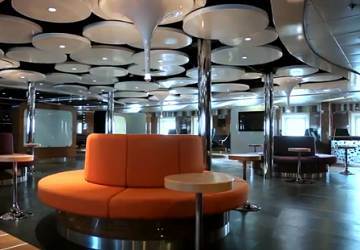 The Stena Superfast VII features a Curious George™ themed play area with soft play corner providing a safe and fun environment for children. In addition to the soft play area, there is a children’s cinema and an interactive zone with touch screen technology meaning there's lots to keep young ones occupied. 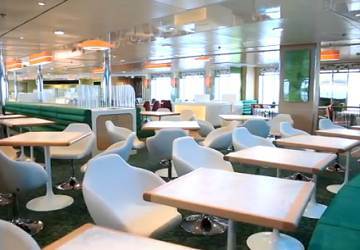 Please Note: Whilst we have taken great care in making our Superfast VII guide as accurate as possible, onboard facilities, services and entertainment may vary depending on the date and time of year that you travel, facilities mentioned may change without notification and ferry companies reserve the right to operate vessels other than those mentioned at time of booking without prior notification. Simple, straightforward, punctual, staff friendly. 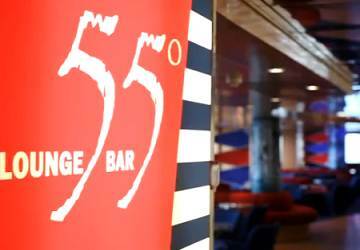 "Very enjoyable first trip to Ireland with Stena Line"
From booking, to the embarkation and dis-embarking all aspects of the voyage was enjoyable. Helpful staff. Reliable timekeeping. Pleasant journey. Always better than flying. However always find their website difficult to use and end up using direct ferries site. It should not be this way. After a long drive, it was a welcome break to be able to unwind in the room and have a short nap. Not that the babies allowed it, but great to lie down in bed for 2 h. Staff was very helpful and made the whole thing very straight forward. The trip was smooth and very comfortable. The staff of the sailing team provided excellent service. I have used the 1130 sailing many times and always enjoyed the experience. Staff were pleasant and helpful. Nice smooth crossing in comfortable, clean surroundings. 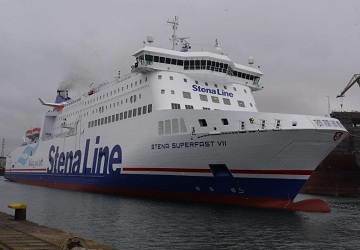 If you want to take the ferry, there's no better way than Stena line.